One morning in the late ninth century a Viking ship sailed up Breiðafjörður. The leader of the small group of people on the ship had been a nobleman’s daughter in Norway, a Viking queen in Dublin, the mother of a Viking king in the Hebrides and Scotland, and now she was about to become the one of the most distinguished of the original settlers of Iceland. Her name was Aud, sometimes called Unn, and she was known as ‘the Deep-Minded’. Breiðafjörður from above Stykkishólmur harbour. Aud’s importance as one of the most prominent early settlers is clear. Her story, in rather abbreviated forms, is told at the beginning of both the Saga of the People of Laxardal, and the Saga of Eirik the Red. She was the daughter of Ketil Flat-nose, a Norwegian lord who became king over the Hebrides following the supposed unification of Norway by Harald Fine-hair in the late 9th century. 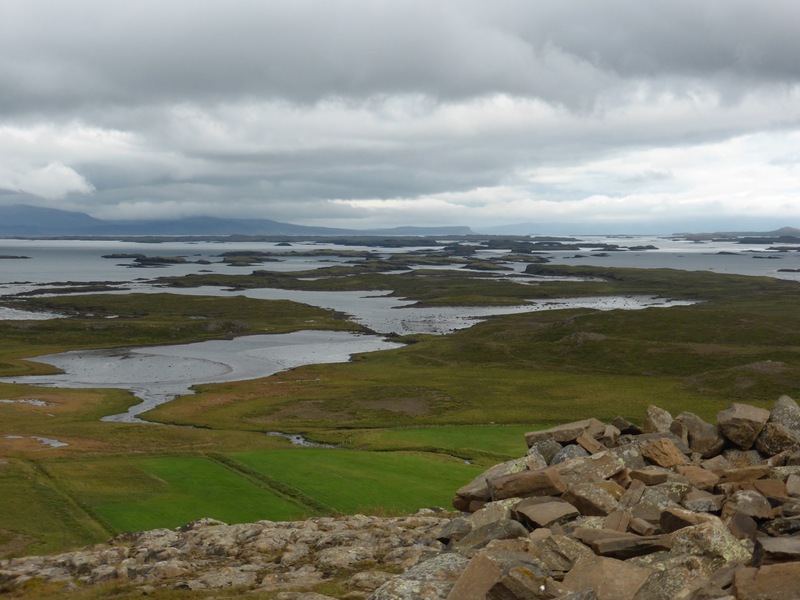 The accounts differ on how this came about – some say he went west to escape the tyranny of King Harald, the same reason given for much of the early settlement of Iceland. Others say Harald sent him to extend Norwegian rule into the Western Isles, but having established himself there Ketil then felt little compulsion to send any taxes back to Norway. Certainly he fell out with the king, and with their Norwegian lands confiscated Ketil’s descendants ended up living all over the western part of the Viking world. 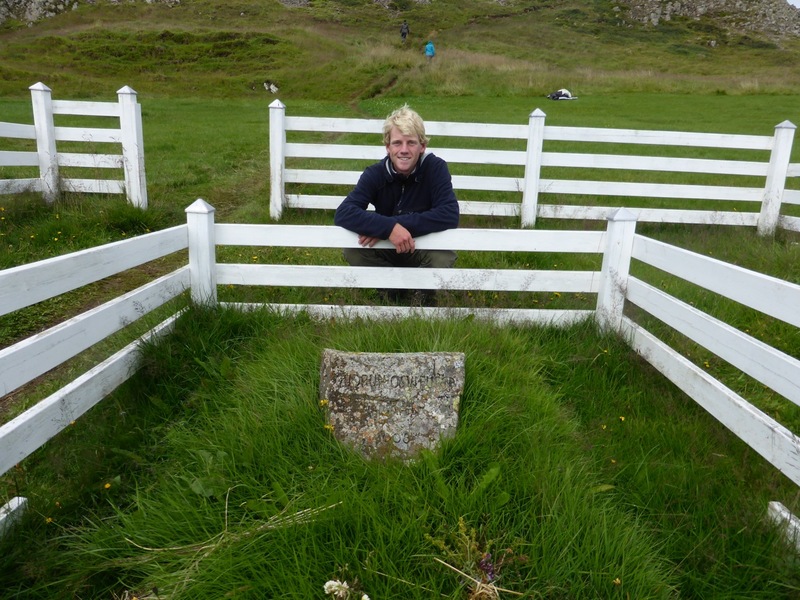 Aud had a number of adventures, including a desperate escape to Orkney in a hastily built little boat, following her son’s defeat and death at the hands of a Scottish army in Caithness – a story reminiscent of Bonnie Prince Charlie’s escape to Skye. Eventually Aud arrived in Iceland, where two of her brothers had already settled. She stayed her first winter with her brother Bjorn, further out along the southern shore of Breiðafjörður. 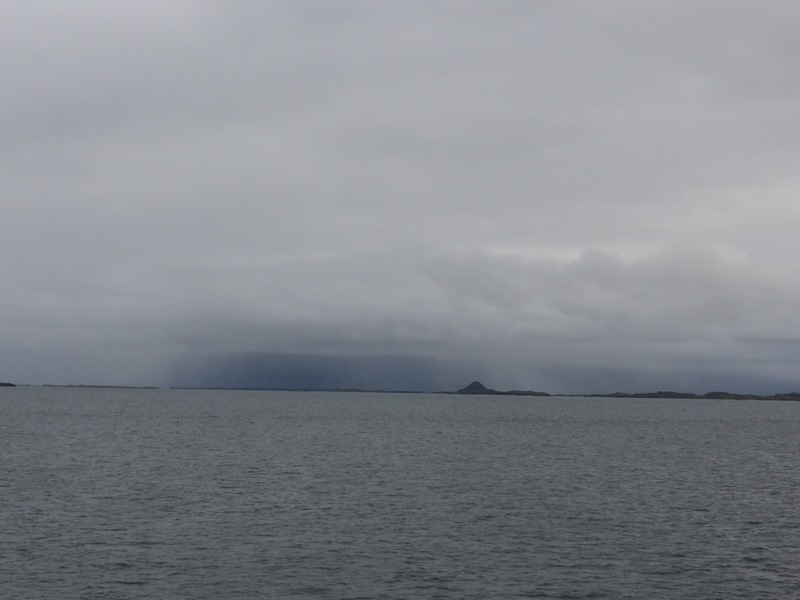 The following spring she set out to claim some land of her own, and somewhere just outside Stykkishólmur her route transected my own, as my early morning ferry steamed out of the harbour and northwards across the fjord. Dagverðanes at foot of ridge. 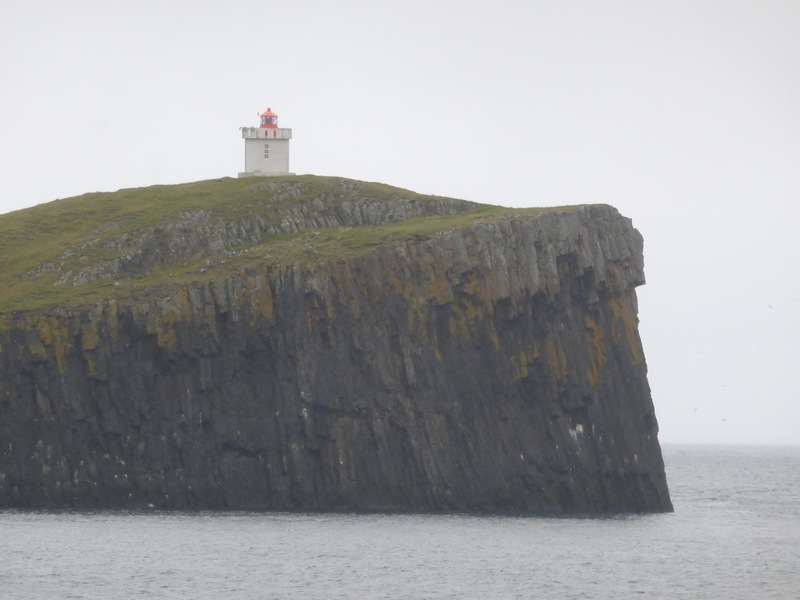 To the west of the ferry we passed Elliðaey, now home only to a lighthouse and a large colony of seabirds, nesting on the basalt cliffs. 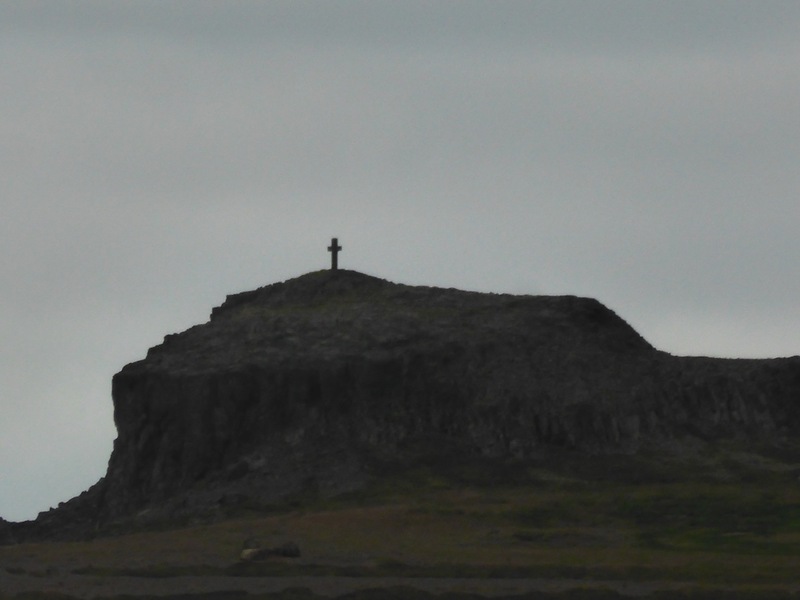 At one time, however, Elliðaey was an important waymark for voyagers leaving Iceland. Out in the middle of the fjord, it was the perfect spot to wait for the right wind to begin a journey, particularly if you had killed a few too many people to be safe on the mainland. If a wind blew up that could bring an outlaw’s enemies out to attack him there, the same wind would carry him out to the relative safety of the ocean long before they got there. 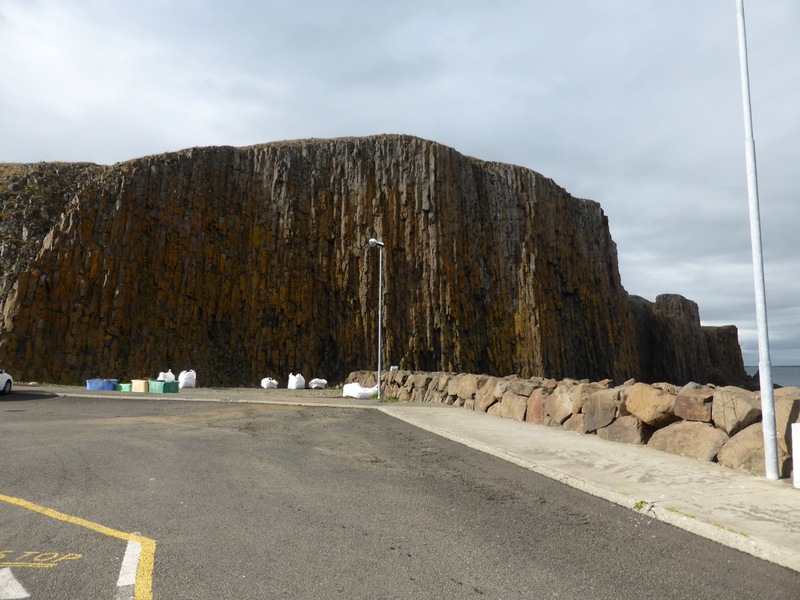 Nesting site on basalt cliffs, Elliðaey. 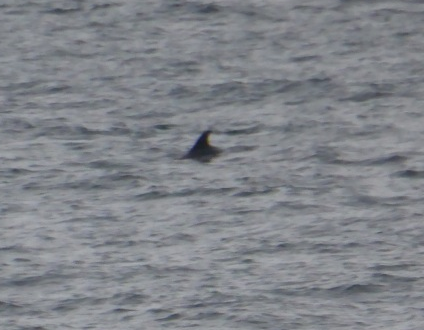 An open stretch of ocean followed, and with the weather worsening I retired to the middle deck to read up on the outlaw Gisli Sursson, whose realm I was about to enter – only to be called back up on deck by a garbled message from the speaker system, the only intelligible word of which was echoed all over the ship – ‘dolphins!’ They were far away and dropping back further as the ferry ploughed on, but unmistakable as their fins and backs broke the surface. 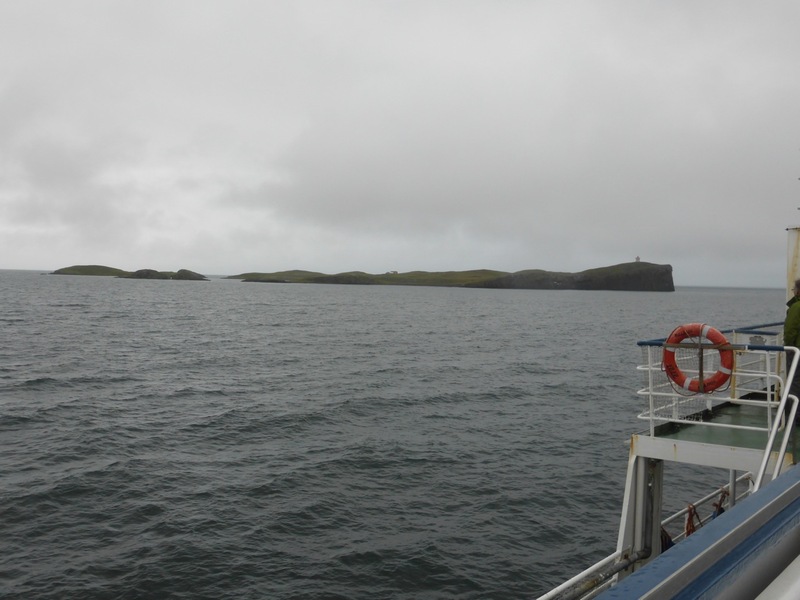 By the time the ferry steamed up to the jetty at Flatey we were mostly pretty cold and wet, but excited too. 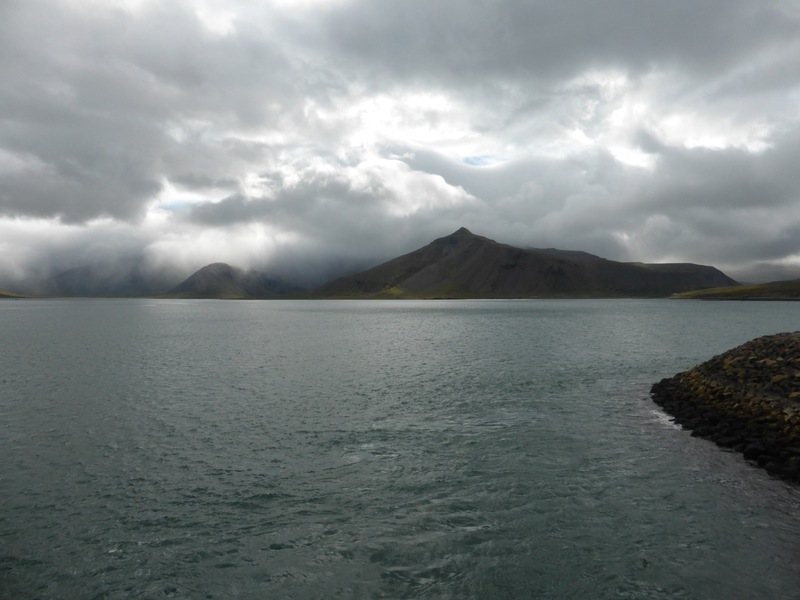 Breiðafjörður is a teeming haven for numerous bird species, as well as seals, dolphins, and whales, and I was keeping a particular look out for the latter, though without success. 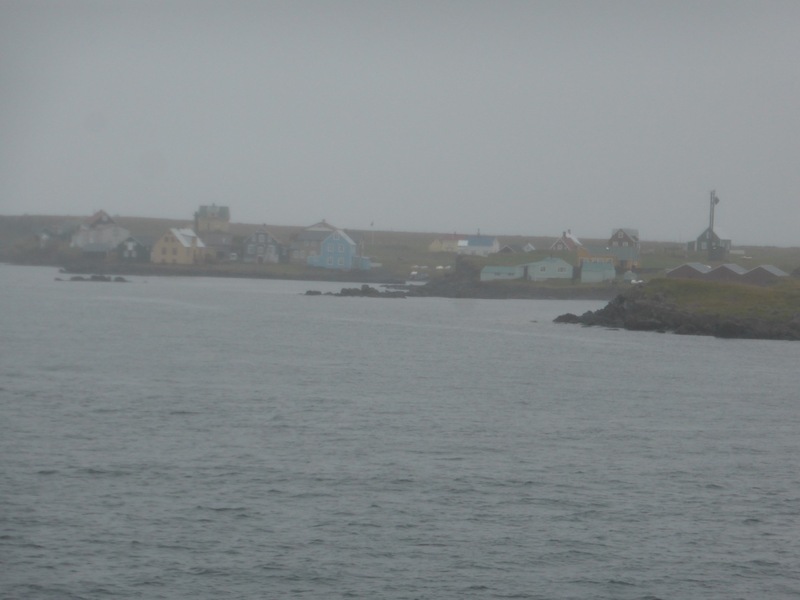 Flatey is the only one of the thousands of islands in Breiðafjörður still inhabited year round, albeit only just – its winter population is reputed to be five people and a dog. 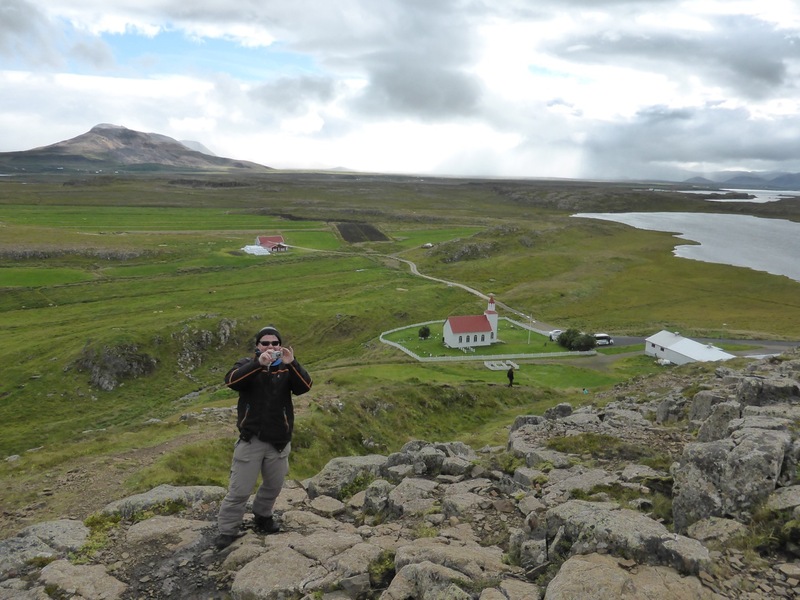 For centuries it was an important monastic and then trading centre, and the home of the invaluable medieval manuscript collection Flateyjarbók, but these days it is advertised primarily as a place to stroll among the attractive painted houses and birdwatch – on a nice day. 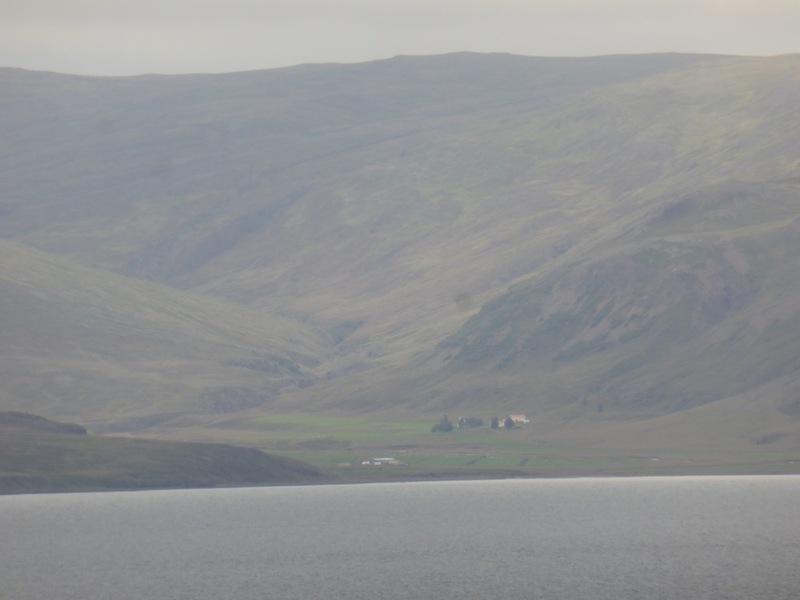 This day was wet and windy, and the next ferry wasn’t for another five hours, so I did my admiring from the upper deck of the ship as it continued northwards through fog and rain to the remote Westfjords, homeland of one of my favourite of all the saga characters, Gisli Sursson. 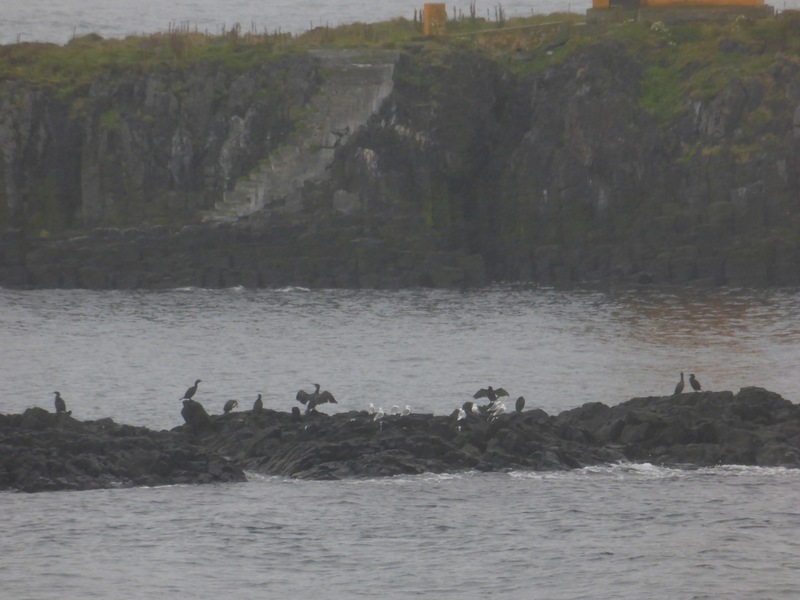 Cormorants/shags and gulls near Flatey jetty. It seemed appropriate, with the depiction of women in the sagas fresh in my mind, to be heading towards Helgafell, the ‘Holy Mountain’. 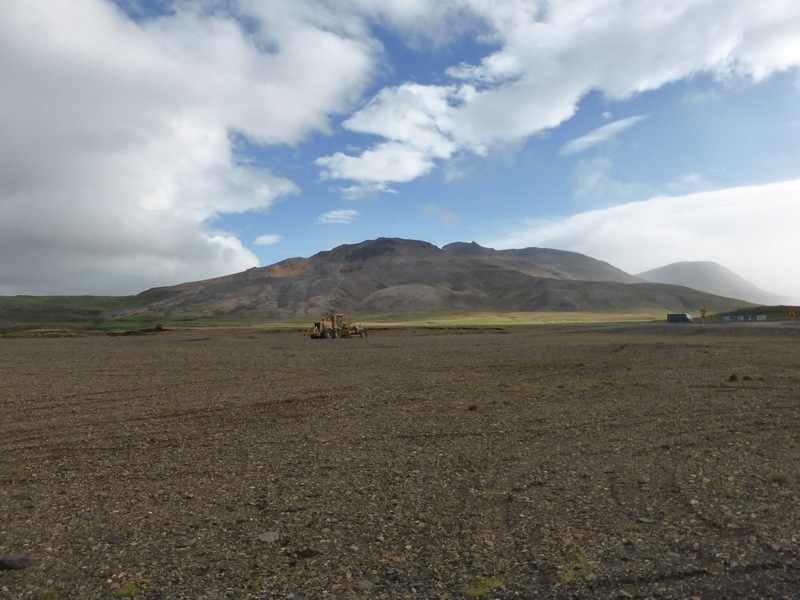 An important site from the first years of the settlement of Iceland, Helgafell was at different times the home of two key figures in the family sagas: Snorri the Godi, and Gudrun Osvifsdottir. Gudrun is remarkable for being, arguably, the only woman with the leading role in a saga, the epic Saga of the People of Laxardal. This, one of the best and best-known of all the sagas will have a blog post to itself when I get to Laxárdalur, but Helgafell is a good place to consider Gudrun herself, as it is where she spent the second half of her life, where she died, and where her tomb stone is still visible and visited. 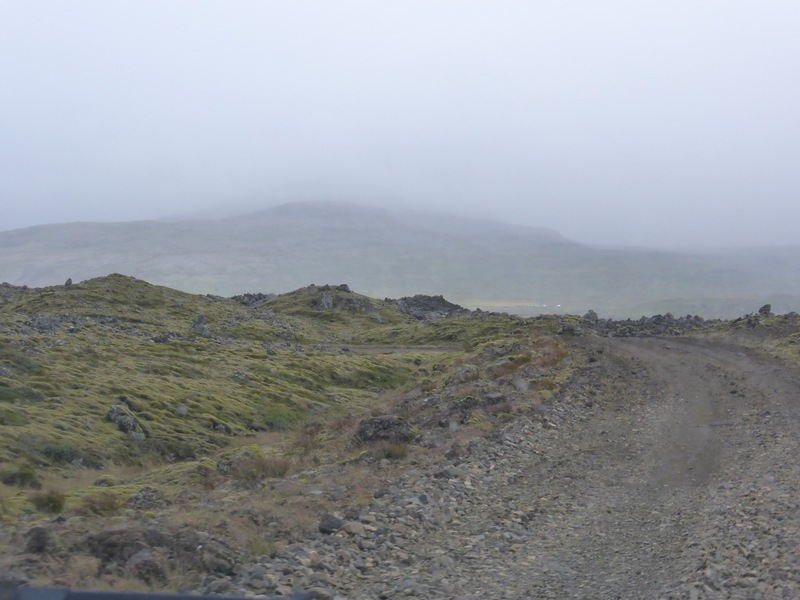 But it is a long and winding road from the end of Snaefellsnes Peninsula to Stykkishólmur, where Helgafell stands, through a landscape full of stories. Here is the site of a terribly haunted farm, further along a witch’s farm, above the road there a cliff two slaves ran off in a panic; there are too many to tell here and now, but it is perhaps worth giving a short version of one of these stories. 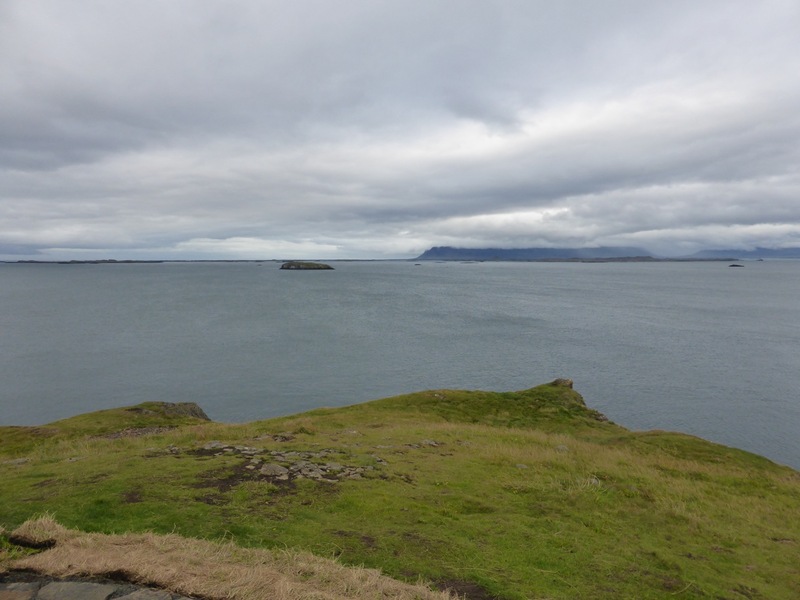 It concerns Helgafell’s most famous resident, Snorri the Godi, in a well-known story that is intrinsically linked to the landscape of northern Snaefellsnes. Búlandshöfði, off which the unfortunate slaves ran. As you draw closer to Helgafell, travelling from the west, you come upon a great sea of lava, a wall of ancient moss-covered rock, frozen into a maze of sharp points and jagged edges. 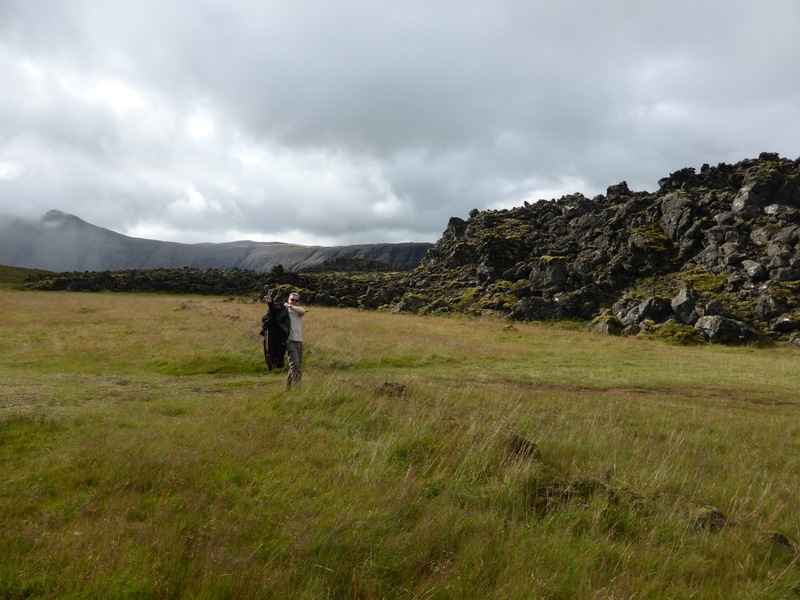 The modern road passes right over it, but an older track follows the southern edge of the lava across grassy meadows, and I, still with my friend from the previous day, followed this route. From this angle the full depth of the lava flow can be seen, over six metres in places, and one can appreciate just what an obstacle it must have presented to the Viking farmers who lived along its edges. One of these was the farmer Styr, who had in his household two berserks, a valuable asset, but violent and difficult men to control. One of them took a liking to the farmer’s daughter, and asked Styr to marry her to him. In addition to the berserk’s difficult nature, he had no property or other assets, so Styr was naturally unwilling to agree to this, but afraid to reject the request outright. He went to Helgafell to ask the advice of the chieftain Snorri, who lived there at the time. Snorri was known for his cunning and good advice, and the two of them went up onto the hill beside the farm and talked for some time. When Styr returned home he told the berserk he could marry his daughter, but since he had no possessions to bring to the marriage he would have to pay in advance by performing certain tasks for Styr. Amongst other things, he and his brother were to clear a path across the lava field, a task ordinary men could not accomplish with years of labour. But the brothers set to, going into one of their famous berserk fits, and worked furiously until the path was cleared. Meanwhile Styr had an underground steam bath constructed by his farm, and when the berserks returned, utterly exhausted now that the berserk fit had passed, he invited them to relax with a steam bath. When they had gone down into the chamber, already prepared with extremely hot rocks to create steam, Styr barricaded the door and laid out a slippery cowskin on the steps outside. Then he had large quantities of water poured in onto the hot rocks through an opening at the top, creating a choking quantity of steam. The berserks realised something was wrong and charged at the door. Even in their weakened state they were able to force the door, but Styr, quite a warrior himself, was waiting with his spear. The first berserk slipped on the cowskin, and Styr speared him through, before finishing off the second berserk over his brother’s body. This was cause for celebration all round, especially for Snorri, who then married Styr’s daughter himself. Reading it today, however, one cannot help feeling rather sorry for the berserks who were deceived and murdered so callously. Berserks occupy a curious place in Viking society, and in the saga literature. Prized possessions, they were a valuable asset to any powerful chieftain’s entourage, provided he had the means to provide for them, and plenty of violent business to occupy them. But they were also despised and distrusted, and as in this story, not really treated as humans at all. In the sagas berserks are the main category of Viking that regularly abduct women, and many of the heroes of the sagas prove themselves by challenging and defeating berserks in this kind of situation. 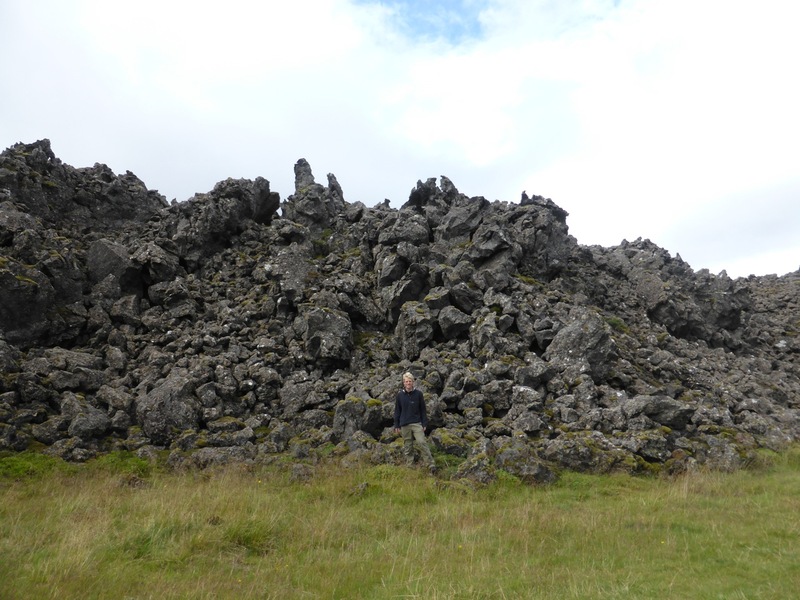 After leaving the lava it is a short drive to Helgafell, just outside Stykkishólmur. 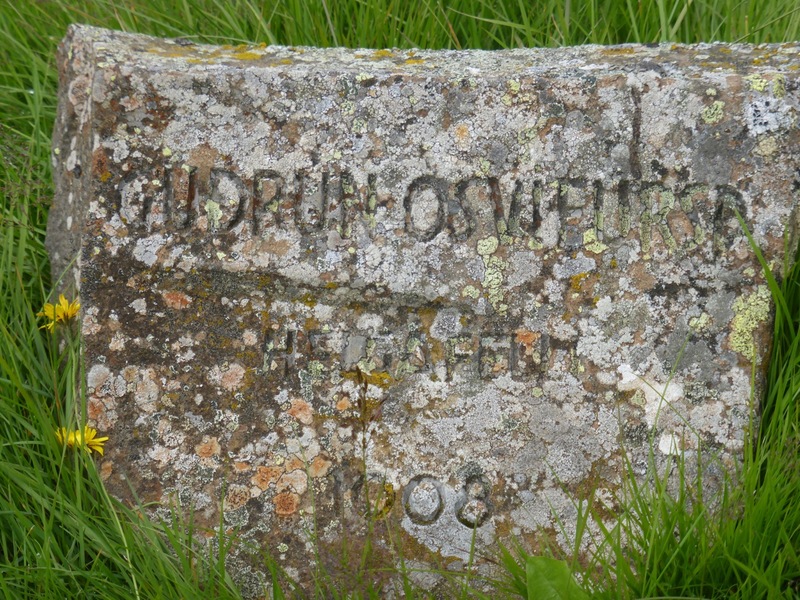 A little church sits beside the small hill that is the ‘holy mountain’, and just outside the church wall is the gravestone of Gudrun Osvifsdottir. 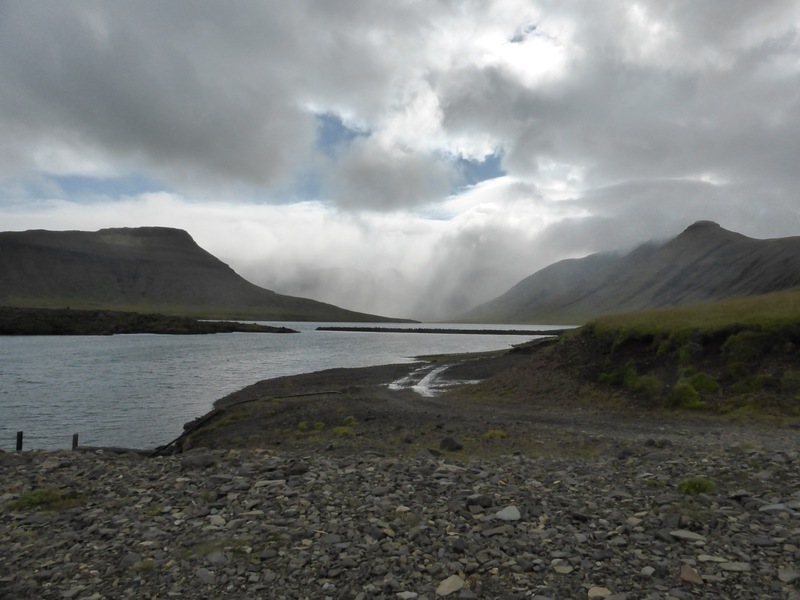 Gudrun was born and grew up at Laugar, at the north-eastern end of the fjord which runs inland from Helgafell, and she was widely regarded as the most beautiful and intelligent woman in Iceland. She was witty and astute, and good with people; today she would probably have become president or prime minister of Iceland. In the tenth century it meant only that she had the pick of the young men, and she became engaged to an outstanding young man from the same region, Kjartan Olafsson. However, as so often happens in the sagas, Kjartan went abroad to seek his fortune and make his name, and failed to return after the three years agreed for their engagement. Instead Gudrun was persuaded by her father and brothers to marry Kjartan’s best friend and foster-brother, Bolli, who told her that Kjartan had become involved with a Norwegian princess and was unlikely to return to Iceland. Gudrun and Bolli were married the same night Kjartan finally returned home, and the predictable fall out was a lot of bad blood, and a good deal of spilt blood. The saga lays much of the blame for this at Gudrun’s feet, for it was her anger and dismay at being tricked out of marrying the man she loved that led to the breakdown in relations between the families. Undoubtedly, she was largely responsible for the deaths of Kjartan and, therefore, Bolli, who was killed in revenge for Kjartan’s death. But I find it hard not to think that it was those who created the situation in the first place that bear the prime responsibility, Kjartan and Bolli themselves. However, the local people did not think so, and Gudrun made a timely land swap with Snorri, escaping from her outraged neighbours to Helgafell, where she lived for the remainder of her life. From Gudrun’s grave a path winds its way up Helgafell, a little steep-sided crag that stands out in the flattish landscape of the little peninsula from which it rises. Standing by the ruins of an old chapel on the summit, the views in every direction are excellent. In three directions wide fjords stretch almost as far as the eye can see, broken by a myriad of tiny islands, while to the south the brightly coloured mountainous landscape of Snaefellsnes lines the horizon. 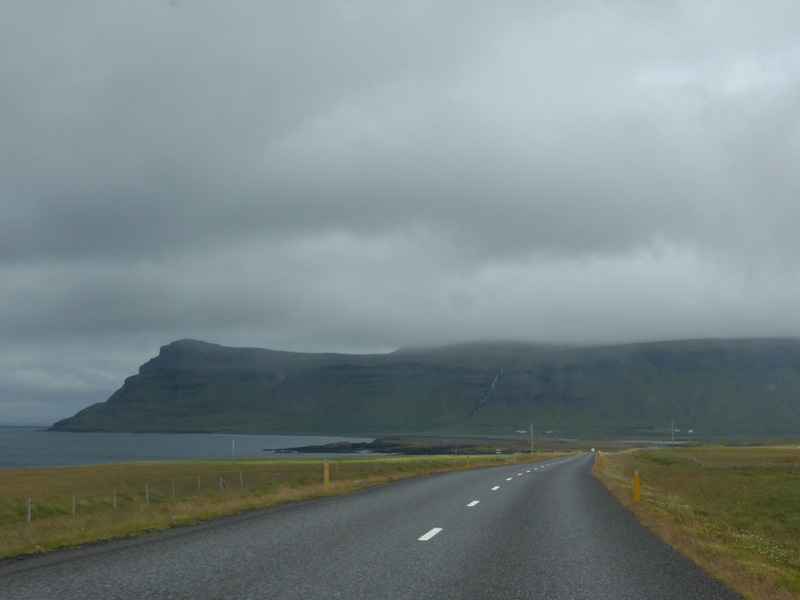 But I had eyes only for the fjords; I was finished with Snaefellsnes for now, and already anticipating the next morning’s ferry journey that would take me across to the remote Westfjords.